Cryptocurrency is a tricky topic for digital marketers. On the one hand, the topic has shifted into the mainstream lately. As cryptocurrencies make up a bigger and bigger wodge of our economy, the subject becomes everybody’s business. On the other hand, it’s an even more esoteric and technically complex area than the regular markets. And it’s an area that has been quickly colonized by a certain crossover subculture of geeks and money men (and while there are plenty of women making a mark, too, there is a worrying machismo around the whole topic). Sharing cryptocurrency stories with your audience, then, can be a tricky business. It remains a strange voodoo with its own language to outsiders. But this can actually be an advantage. Because while the ground level ins-and-outs of the trade may well be beyond the ken of the average reader, much of the jargon and vernacular around the subject is quite colorful and descriptive. It references real-world images and established slang words and can provide an easy “in” to the unconverted. 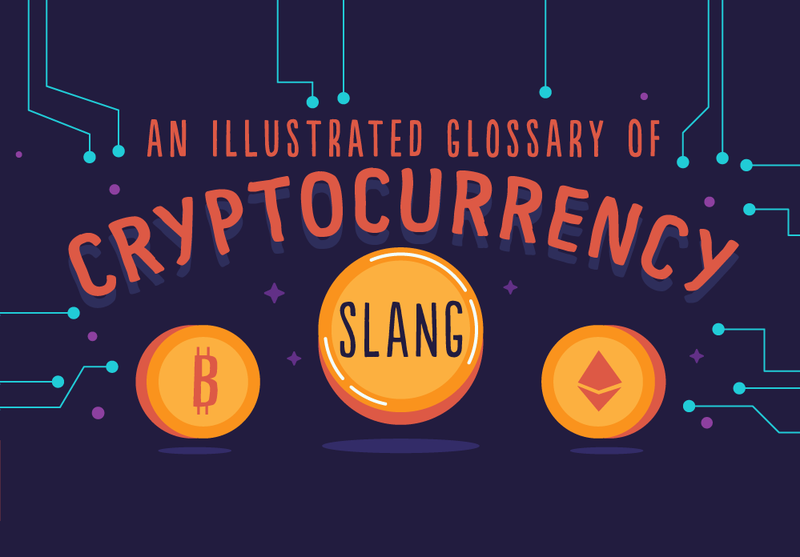 This new illustrated cryptocurrency glossary from 99Bitcoin is a godsend. It lays out nine key terms that make up the everyday parlance of the bitcoin trader, from Whale (a real-world reference indicating a trader who owns a large proportion of a particular currency) to Shill (a reworking of an old slang word, now indicating a trader who gives dishonest advice to boost their own prospects). Bloggers can share the infographic itself to bring their readership up-to-date on all things crypto, or simply start to drop these words into their articles to make the concepts more visual and relatable to those still catching up with the future of our digital economy. It’s time to invest in cryptocurrency vocabulary!